Our fun friends at Finkel and Garf are celebrating their 4th anniversary this weekend on Friday July 20th from 3pm – 9pm. This local Gunbarrel favorite has a chill vibe and lots of games to entertain the kid in us all. It is definitely worth the short hop down the Diagonal or, even better, jump on the bike and ride out to join the usual crew of cycling fans often spotted there on weekends. 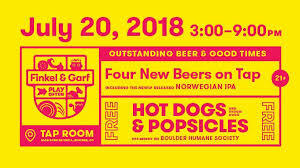 In addition to the loads of fun and funky snacks they offer for sale, you’ll be able to get hot dogs, veggie dogs and some other treats all free of charge for the celebration. I am always impressed with the fruit infused brews as they don’t hit you over the head with extra flavor but, rather, provide a more subtle, crisp and refreshing component. Images courtesy of Finkel & Garf and this great article from 5280.